PALMDALE – Extra officers will be on duty in Palmdale this Wednesday, May 23, looking for violations made by drivers, bike riders and pedestrians, authorities announced. 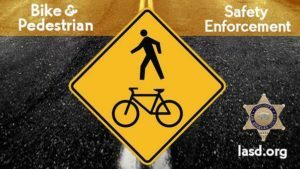 The “Bike & Pedestrian Safety Enforcement Operation” is part of an overall effort to lower deaths and injuries, according to a news release by the Sheriff’s Information Bureau. The Los Angeles County Sheriff’s Department has investigated 4,909 fatal and injury collisions involving pedestrians and bicyclists during the past three years, officials said in the news release. The news release did not specify where in Palmdale or what time the traffic enforcement operation would take place. Officials said the department mapped out locations where bicycle and pedestrian-related traffic crashes occurred over the past three years, and extra officers would be on duty patrolling those areas. “Special attention will be directed toward drivers speeding, making illegal turns, failing to stop for signs and signals, failing to yield to pedestrians in cross walks or any other dangerous violation. Additionally, enforcement will be taken for observed violations when pedestrians cross the street illegally or fail to yield to drivers who have the right of way. Bike riders will be stopped and citations issued when they fail to follow the same traffic laws that apply to motorists,” the sheriff’s news release states. Funding for Palmdale Sheriff Station’s Bike and Pedestrian Safety Enforcement Operation is provided by a grant from the California Office of Traffic Safety through the National Highway Traffic Safety Administration. 6 comments for "Traffic enforcement operation in Palmdale this Wednesday"
… our dysfunctional government shakes us down, for every red cent they can squeeze? But, Stormy Daniels, she gets the key to the city? Don’t speed, don’t make illegal turns, stop for signs and signals, yield to pedestrians in crosswalks. Pedestrians, and bike riders do your part to stay safe. It’s really simple. Relax, this isn’t that big of a deal. Maybe someone will actually learn a lesson and apply what they’ve learned. It’s your money. They want your money. All those Ivory Tower 6-figure jobs at the Michael D Antonovich Superior Court are hinged upon one thing: traffic ticket revenue. All those million dollar McMansions they’ve mortgaged, and all those luxury vehicles they drive, their Epicurean lifestyles, lavish trips they take to the Caribbean, they’re desperate. They’ve got to have to have the money. You hear so often in these comments about folks wishing cops would write more tickets here or there or “If the cops would have been enforcing the speed limits there and write tickets the terrible crash would not have happened. It becomes the fault of the cops. Then when they address the issue in a specific place for a specific problem, that was researched and based on facts, you get people like David who thinks it is all about pimping and whores in the system of law enforcement. I have an idea David. Come up with a fair and equitable method of stopping the disruption within your community that better suits your desires. Share it with all around the community and put the plan into action. Problem is that these things are not researched to “address a specific problem,” they are based on where the most tickets can be written in the least amount of time and effort. Before the widening project on Avenue S there was a place where people routinely ignored the “no left turn” sign and made very dangerous exits from a parking lot onto Avenue S. No one could get a cop to sit there and watch, because even though it was certainly often enough to be dangerous they would likely have to sit for thirty minutes or more to write a single ticket, while not far down the road they could just haul people over one after another for traveling safely with the flow of traffic, which always ran at fifteen over the limit. Before I retired I used to have to drive around all day. I’d see at least a couple really dangerous things being done pretty much every day. But a cop can’t get by on just writing a couple tickets a day for really dangerous things, so they haunt places where they can write a bunch of tickets to unsuspecting people who are just motoring along doing what everyone else is doing, which is pretty safe or they wouldn’t be doing it. … yet another traffic ticket revenue honey trap, in beautiful Palmdale? In this situation, the pimp would be analogous to the Michael D Antonovich superior court. The whore would be indicative, of the LASD.